(Nanowerk News) Using a technique that provides detailed images of nanoscale structures, researchers at the University of Michigan and Detroit's Henry Ford Hospital have discovered changes in the collagen component of bone that directly relate to bone health. Their findings, published online Dec. 16 in the journal Bone, could lead to new methods of diagnosing osteoporosis and other diseases affecting collagen-containing tissues. Bone is a composite material made up of a flexible collagen matrix impregnated with and surrounded by a stiffer, stronger mineral component. Though much is known about the importance of bone health to overall health, there's a critical lack of knowledge about the sub-microscopic structure of bone and how collagen and mineral—and the interactions between them—contribute to properties of healthy and diseased bone. A three-dimensional rendering from the surface of a mouse bone. In this 3.5 x 3.5 micrometer image (100 nanometer height), the rich sample topography characteristic of bone is evident. Type I collagen fibrils are seen running in a bundle from left to right near the top. A second layer of fibrils appears to be running below, almost perpendicular to this bundle, near the bottom corner. "Our initial question was, could we discover more about the nanoscale structure of the collagen in bone, using the technique of atomic force microscopy," said Mark Banaszak Holl, a U-M professor with joint appointments in chemistry and macromolecular science and engineering. The atomic force microscope, one of the most valuable tools for imaging, measuring and manipulating matter at the nanoscale level, works something like a phonograph with a motion detector attached to its needle. As the tip systematically moves across a bumpy surface, the motion detector records its every movement. 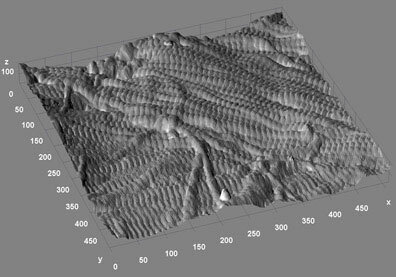 The result is a three-dimensional image of the surface's contours. Using such an instrument, the researchers were able to see and measure key features of collagen fibrils in mouse bone. Each collagen fibril is made up of many individual collagen molecules packed together in a staggered array that resembles a railroad track. "For each fibril, we measured the mean spacing of the 'railroad track' cross hatches," said post doctoral associate Joseph Wallace, the paper's lead author. Wallace, Banaszak Holl and coworkers found that not all fibrils had the same mean spacing, a finding that ran counter to conventional wisdom in the field. "As opposed to a single value, our data indicate that normal bone contains a distribution of collagen fibril spacings," Wallace said. Next, the team wanted to know if the distribution of fibril spacings differed in bone from healthy and diseased individuals. To address that question, they collaborated with Clifford Les of Henry Ford Hospital, who has been studying how bone changes when estrogen wanes, as it does in menopause. To model the age-related estrogen depletion that occurs in humans, Les uses sheep that have had their ovaries removed. The sheep exhibit some of the same symptoms as menopausal women, and they undergo some bone remodeling, but they don't develop osteoporosis. When the researchers compared bone from normal and ovariectomized sheep, they found striking differences in fibril spacing distributions, suggesting that estrogen depletion has a significant effect on the spacing. "This ability to measure fibril spacing and to distinguish between normal and diseased bone not only gives us a powerful method to study the mechanism of disease at the nanoscale, but it also has important implications to the future diagnosis of disease in bone and perhaps other collagenous tissues," said Banaszak Holl. "Collagen is the most common protein in the mammalian body. It's in bones, teeth, tendons, skin, arteries. We basically don't work well when it's not working well, so there are many diseases related to problems with collagen. We're very excited about developing this method as a diagnostic for all kinds of diseases of structural collagen." The technique could be a powerful complement to the current gold standard for diagnosing osteoporosis: measuring bone mineral density (BMD) with dual energy X-ray absorptiometry (DEXA). Although widely used, DEXA isn't ideal, because people with normal BMD can still get fractures, and abnormalities often don't show up until after a fracture has occurred. Changes in collagen, on the other hand, may be apparent earlier in the disease's progression. To further explore the method's potential, the researchers plan to use it to study collagen fibril spacing in human patients with and without osteoporosis. U-M has filed for patent protection and is seeking a commercialization partner to help bring the technology to market. "This project is an example of what happens if you put the right group of people together on a problem," said Banaszak Holl. Wallace, a biomedical engineer, had experience working with bone in previous research; Banaszak Holl's lab group brought expertise in surface analysis; Les contributed knowledge about bone biology and understanding of the sheep model; and coauthors Bradford Orr, director of the Applied Physics Program, and Blake Erickson, a biophysics graduate student, are skilled in data analysis. "All these different pieces were necessary to solve the problem," Banaszak Holl said.